The pediatric specialists at Children’s Healthcare of Atlanta provide a full range of care to children with brain and nervous system conditions, including concussion, cerebral palsy, epilepsy, spinal conditions and spina bifida. We offer comprehensive evaluations, behavior treatments and the latest research to help families living with autism spectrum disorder. Our specialists provide a full spectrum of care for children with brain tumors, from neurosurgery to rehabilitation. Our Brain Injury Program helps children overcome the challenges of living with a brain injury or other neurological condition. We offer personalized care and expertise to help children work through developmental issues, which can occur in children with heart conditions. Our therapists guide children through specialized exercises to help them build strength and coordination, and develop new abilities. We offer personalized care plans to meet the needs of children with cerebral palsy, a brain disorder that affects muscle tone. Our cognitive remediation therapy helps adolescents with neurological trauma gain abilities and focus on strengths. Our expert team, including a dedicated concussion nurse, helps children and teens return to activities safely after a concussion. Children’s offers advanced care for children with difficult-to-control epilepsy, a brain illness that causes seizures. We offer specialized rehabilitation therapy for children who are in a minimally conscious state after a brain injury. Our experts diagnose and treat children with nerve and muscular disorders and offer ongoing assistance to manage the disease. We offer expert care for children with spinal disorders, from chronic pain and injuries to spine conditions that are present at birth. We offer comprehensive treatment for children with NF-1, a genetic disease that causes tumors along nerves throughout the body. Our experienced neurology team treats disorders of the nervous system, including conditions of the brain, spinal cord, nerves and muscles. We offer expert care for children and teens with cognitive or behavioral problems, drawing from the expertise of Children’s specialists. We provide specialized care for infants, children and young adults with brain and nerve disorders, such as epilepsy and brain tumors. Our pediatric neurosurgery team, one of the largest teams in the country, offers advanced treatment for children of all ages. 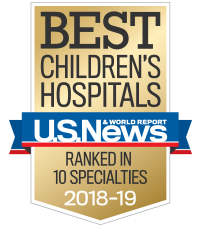 We're among the top pediatric hospitals in the country for treating children with musculoskeletal conditions and injuries. We provide specialized braces (orthotics) and artificial devices to replace part of the body (prostheses) to help children function independently. Our comprehensive rehabilitation therapies help children heal, improve function and quality of life, and restore independence. Our team of specialists provide expert care to manage spasticity, a nerve and muscular condition that interferes with movement and speech. Our specialty team offers ongoing care for children with spina bifida, an opening in the spine that’s present at birth. Our Spinal Cord Injury Program helps adolescents regain skills to maintain as much independence as possible. Our specialized team offers programs to help young adults overcome physical and emotional challenges and gain function to maintain independence. We offer coordinated care and the latest treatments for children with TSC, a genetic disorder that affects the brain.